A must for steak lovers! Are you a steak lover? Then La Luna Steakhouse is the place for you to visit! 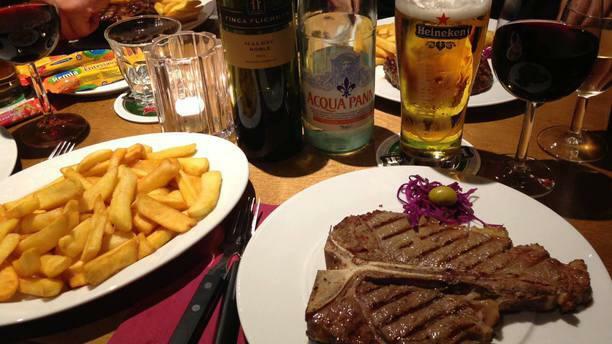 Many say that they have the best Argentinian steak in town! If you find it hard to decide between rib-eye, sirloin or rump steak, the friendly staff is more than happy to help you with your decision. The restaurant is located near Leidseplein, a lively area in Amsterdam, which makes it a great location to start your night out. Nice small quiet place. But with very good food. Cooked to perfection and and the peppercorn sauce was good too! The staff were really nice and friendly - keep in mind they are a smaller business and we witnessed people being rude to them, that was the only thing that bothered us! Always be nice to staff! Great and attentive service, beautiful steaks for a reasonable price! Very friendly service and steak was amazing. Very good steaks for adequate price. We really enjoyed our evening there and food! Amazing steak would definitely visit again!! Found this restaurant on TripAdvisor and decided to book a table! On arrival we were greeted by a man waiting at the door trying to grab customers attention to enter which we found strange and were therefore apprehensive about what was to come. But thankfully we cannot rate this restaurant high enough, the food was exceptional and cooked to perfection (we got garlic bread to start followed by 2 300g fillet steaks - both well done like ordered and they were delicious!) however, though this restaurant is fantastic we were only joined by one other couple for the duration of our meal, creating an awkward atmosphere, although the owners have no control over this. However for the 4.5 star restaurant I feel they shouldn’t be standing at the door trying to lure you in as it has a high enough rating and the food speaks for itself as they clearly don’t need to go to such efforts! Overall it is a hidden gem and definitely the best food we got in Amsterdam!! I couldnt recommend this resteraunt more! Owner welcomed us at the door and took our drinks order straight away. Great selection of soft and alcoholic beverages. After a day walking around amsterdam and endulging in the coffeeshops, this resteraunt reguvinated us. Beautiful steaks and great service! Please enjoy your Steak at an another Steakhouse. Service was disgusting. Prices are too high for the served food and drinks. Really friendly staff and attention to customers. Great service and food - would gladly eat there again! We were few in the restaurant, so all attention were on us. Nice staff from Argentina and food was good quality. Worth a visit for meat lovers. Very welcoming the staff was. The food was delicious and well presented. I would recommend this restaurant to family and friends when visiting Amsterdam. My family had a wonderful time celebrating my husband's 45th birthday. I forgot I had mentioned in my booking, but they remembered! Our steaks were cooked to perfection. Friendliest service of our trip. Mediocre steaks ,came out cold with dry green leaves on the side For someone who travel and eaten in Buenos Aires it was a painful experience.